• At 10:00 AM ET, ISM Manufacturing Index for April. The consensus is for the ISM to be at 58.7, down from 59.3 in March. The PMI was at 59.3% in March, the employment index was at 57.3%, and the new orders index was at 61.9%. • Also at 10:00 AM, Construction Spending for March. The consensus is for a 0.5% increase in construction spending. • All day, Light vehicle sales for April. The consensus is for light vehicle sales to be 17.2 million SAAR in March, down from 17.4 million in March (Seasonally Adjusted Annual Rate). Fannie Mae reported that the Single-Family Serious Delinquency rate decreased to 1.16% in March, down from 1.22% in January. The serious delinquency rate is up from 1.12% in March 2017. By vintage, for loans made in 2004 or earlier (3% of portfolio), 3.24% are seriously delinquent. For loans made in 2005 through 2008 (6% of portfolio), 6.22% are seriously delinquent, For recent loans, originated in 2009 through 2018 (91% of portfolio), only 0.51% are seriously delinquent. So Fannie is still working through poor performing loans from the bubble years. After the hurricane bump, the rate will probably decline to 0.5 to 0.7 percent or so to a cycle bottom. Note: Back in early 2016, I noted that energy expenditures as a percentage of PCE had hit an all time low. Here is an update through the March 2018 PCE report released this morning. Below is a graph of expenditures on energy goods and services as a percent of total personal consumption expenditures through March 2018. This is one of the measures that Professor Hamilton at Econbrowser looks at to evaluate any drag on GDP from energy prices. Data source: BEA Table 2.3.5U. The huge spikes in energy prices during the oil crisis of 1973 and 1979 are obvious. As is the increase in energy prices during the 2001 through 2008 period. In March 2018, energy expenditures as a percentage of PCE increased to 4.05% of PCE, up from the all time low two years ago of 3.6%. Historically this is still a low percentage of PCE for energy expenditures, even though oil prices are up sharply over the last two years (WTI was at $37.55 per barrel in March 2016 and has risen to almost $69 per barrel today). Dallas Fed: "Growth in Texas Manufacturing Rebounds Strongly"
Texas factory activity rose markedly in April after posting slower growth in March, according to business executives responding to the Texas Manufacturing Outlook Survey. The production index, a key measure of state manufacturing conditions, increased 11 points to 25.3. Other indexes of manufacturing activity also rose sharply in April. The new orders and growth rate of orders indexes jumped to their highest readings this year, 27.9 and 18.9, respectively. The capacity utilization index climbed eight points to 18.7, and the shipments index rose nine points to 19.3. Perceptions of broader business conditions remained highly positive on net in April. The general business activity index was largely unchanged at 21.8, and the company outlook index edged up four points to 23.6. Both indexes remained far above their average levels. Labor market measures suggested stronger growth in employment and work hours in April. The employment index came in at 17.8, up six points from March. Twenty-four percent of firms noted net hiring, compared with 6 percent noting net layoffs. The hours worked index moved up four points to 14.3. Based on these regional surveys, it seems likely the ISM manufacturing index will be solid again in April, but probably lower than in March (to be released tomorrow, Tuesday, May 1st). Pending home sales inched higher for the second consecutive month in March, but unrelenting inventory constraints once again kept overall activity below year ago levels, according to the National Association of Realtors®. The Pending Home Sales Index, a forward-looking indicator based on contract signings, inched up 0.4 percent to 107.6 in March from a downwardly revised 107.2 in February. Even with last month's increase in activity, the index declined on an annualized basis (3.0 percent) for the third straight month. The PHSI in the Northeast fell 5.6 percent to 90.6 in March, and is now 8.1 percent below a year ago. In the Midwest the index rose 2.4 percent to 101.3 in March, but is 6.0 percent lower than March 2017. Pending home sales in the South climbed 2.5 percent to an index of 128.6 in March, and are 0.3 percent higher than last March. The index in the West declined 1.1 percent in March to 94.7, and is 2.2 percent below a year ago. This was below expectations of a 1.0% increase for this index. Note: Contract signings usually lead sales by about 45 to 60 days, so this would usually be for closed sales in April and May. Personal income increased $47.8 billion (0.3 percent) in March according to estimates released today by the Bureau of Economic Analysis. Disposable personal income (DPI) increased $39.8 billion (0.3 percent) and personal consumption expenditures (PCE) increased $61.7 billion (0.4 percent). Real PCE increased 0.4 percent. The PCE price index increased less than 0.1 percent. Excluding food and energy, the PCE price index increased 0.2 percent. The March PCE price index increased 2.0 percent year-over-year and the March PCE price index, excluding food and energy, increased 1.9 percent year-over-year. The following graph shows real Personal Consumption Expenditures (PCE) through March 2018 (2009 dollars). Note that the y-axis doesn't start at zero to better show the change. The increase in personal income was slightly below expectations, and the increase in PCE was at expectations. PCE growth was weak in Q1, however inflation is now near the Fed's target. Here is the unofficial problem bank list for April 2018. Update on the Unofficial Problem Bank List for April 2018. The list had a decline of four insured institutions to 94 banks. Aggregate assets declined during the month by $956 million to $18.9 billion. A year ago, the list held 148 institutions with assets of $36.1 billion. Actions were terminated against American Bank of the North, Nashwauk, MN ($550 million); Affinity Bank, Atlanta, GA ($260 million); Allied First Bank, SB, Oswego, IL ($94 million); and South Carolina Community Bank, Columbia, SC ($53 million). CR Note: When the unofficial weekly was list was first published on August 7, 2009 it had 389 institutions. The list peaked at just over 1,000 institutions in 2011. Now there are only 94 banks on the unofficial list (the FDIC reported 95 banks on the official problem bank list at the end of 2017). The FDIC's official problem bank list is comprised of banks with a CAMELS rating of 4 or 5, and the list is not made public (just the number of banks and assets every quarter). Note: Bank CAMELS ratings are also not made public. CAMELS is the FDIC rating system, and stands for Capital adequacy, Asset quality, Management, Earnings, Liquidity and Sensitivity to market risk. The scale is from 1 to 5, with 1 being the strongest. As a substitute for the CAMELS ratings, surferdude808 is using publicly announced formal enforcement actions, and also media reports and company announcements that suggest to us an enforcement action is likely, to compile a list of possible problem banks in the public interest. Other key indicators include the March Personal Income and Outlays report, March Trade deficit, April ISM manufacturing and non-manufacturing indexes, April auto sales, and the April ADP employment report. The FOMC meets on Tuesday and Wednesday, and no change to policy is expected. 8:30 AM: Personal Income and Outlays for March. The consensus is for a 0.4% increase in personal income, and for a 0.4% increase in personal spending. And for the Core PCE price index to increase 0.2%. 9:45 AM: Chicago Purchasing Managers Index for April. The consensus is for a reading of 57.8, up from 57.4 in March. 10:00 AM: Pending Home Sales Index for March. The consensus is for a 1.0% increase in the index. 10:30 AM: Dallas Fed Survey of Manufacturing Activity for April. This is the last of the regional Fed surveys for April. 10:00 AM: ISM Manufacturing Index for April. The consensus is for the ISM to be at 58.7, down from 59.3 in March. The PMI was at 59.3% in March, the employment index was at 57.3%, and the new orders index was at 61.9%. All day: Light vehicle sales for April. The consensus is for light vehicle sales to be 17.2 million SAAR in March, down from 17.4 million in March (Seasonally Adjusted Annual Rate). 8:15 AM: The ADP Employment Report for April. This report is for private payrolls only (no government). The consensus is for 193,000 payroll jobs added in April, down from 241,000 added in March. 2:00 PM: FOMC Meeting Announcement. The FOMC is expected to announce no change to policy at this meeting. 8:30 AM ET: The initial weekly unemployment claims report will be released. The consensus is for 220 thousand initial claims, up from 209 thousand the previous week. The consensus is for the U.S. trade deficit to be at $50.0 billion in March from $57.6 billion in February. 10:00 AM: the ISM non-Manufacturing Index for April. The consensus is for index to decrease to 58.5 from 58.8 in March. 8:30 AM: Employment Report for April. The consensus is for an increase of 190,000 non-farm payroll jobs added in April, up from the 103,000 non-farm payroll jobs added in March. In March the year-over-year change was 2.261 million jobs. Oil Rigs: "Beginning of Shale's Super-Goldilocks Period?" • Cana Woodford added 9 rigs, but is still below its level of earlier this year. Graph and comments Courtesy of Steven Kopits of Princeton Energy Advisors LLC." Freddie Mac reported that the Single-Family serious delinquency rate in March was 0.97%, down from 1.06% in February. Freddie's rate is up from 0.92% in March 2017. Note: Fannie Mae will report for March soon. IMPORTANT NOTE: In the GDP report, real residential investment was unchanged in Q1. But residential investment (RI) as a percent GDP actually increased in Q1! How can that be? The answer is that the price index for residential investment increased sharply in Q1 (up 8.5% annualized). The large increase in the residential investment price index follows what we are hearing from home builders - that material costs have increased sharply (the tariffs haven't helped, but other prices are up too). This hurts both builders and home buyers. The first graph below shows the contribution to GDP from residential investment, equipment and software, and nonresidential structures (3 quarter trailing average). This is important to follow because residential investment tends to lead the economy, equipment and software is generally coincident, and nonresidential structure investment trails the economy. Residential investment (RI) was unchanged in Q1 (0.0% annual rate in Q1). Equipment investment increased at a 4.7% annual rate, and investment in non-residential structures increased at a 12.3% annual rate. On a 3 quarter trailing average basis, RI (red) is up, equipment (green) is solidly positive, and nonresidential structures (blue) is up slightly. Recently real RI has been soft. I'll post more on the components of non-residential investment once the supplemental data is released. Residential Investment as a percent of GDP increased in Q1, and RI has generally been increasing. RI as a percent of GDP is only just above the bottom of the previous recessions - and I expect RI to continue to increase for the next couple of years. The increase is now primarily coming from single family investment and home remodeling. The third graph shows non-residential investment in structures, equipment and "intellectual property products". Investment in equipment - as a percent of GDP - picked up. Real gross domestic product (GDP) increased at an annual rate of 2.3 percent in the first quarter of 2018, according to the "advance" estimate released by the Bureau of Economic Analysis. In the fourth quarter, real GDP increased 2.9 percent. The increase in real GDP in the first quarter reflected positive contributions from nonresidential fixed investment, personal consumption expenditures (PCE), exports, private inventory investment, federal government spending, and state and local government spending. Imports, which are a subtraction in the calculation of GDP, increased. The deceleration in real GDP growth in the first quarter reflected decelerations in PCE, residential fixed investment, exports, and state and local government spending. These movements were partly offset by an upturn in private inventory investment. Imports, which are a subtraction in the calculation of GDP, decelerated. The advance Q1 GDP report, with 2.3% annualized growth, was above expectations. Personal consumption expenditures (PCE) increased at 1.1% annualized rate in Q1, down from 4.0% in Q4 (this is weak). Residential investment (RI) was unchanged in Q1. Equipment investment increased at a 4.7% annualized rate, and investment in non-residential structures increased at a 12.3% pace. [T]he data added 0.2pp to 1Q GDP tracking, bringing it up to 1.9% qoq saar heading into tomorrow's advance release. [April 26 estimate]. • At 8:30 AM ET, Gross Domestic Product, 1st quarter 2018 (Advance estimate). The consensus is that real GDP increased 2.0% annualized in Q1, down from 2.9% in Q4. • At 10:00 AM, University of Michigan's Consumer sentiment index (Final for April). The consensus is for a reading of 98.0, up from 97.8. The automakers will report April vehicle sales on Tuesday, May 1st. Note: There were 24 selling days in April 2018, down from 26 in April 2017. It appears April will be another solid month. So far sales in 2018 are running at about the same rate as in 2017. The Federal Reserve Bank of Kansas City released the April Manufacturing Survey today. According to Chad Wilkerson, vice president and economist at the Federal Reserve Bank of Kansas City, the survey revealed that Tenth District manufacturing activity expanded more rapidly in April, and optimism remained high for future activity. The month-over-month composite index was 26 in April, up from readings of 17 in March and 17 in February. The composite index is an average of the production, new orders, employment, supplier delivery time, and raw materials inventory indexes. Factory activity accelerated at both durable and nondurable goods plants, particularly for machinery, plastics, and chemicals. Month-over-month indexes increased considerably. The production index jumped from 20 to 33, and the shipments, new orders, and order backlog indexes also rose. The employment and new orders for exports indexes were unchanged. The raw materials inventory index increased from 11 to 17, while the finished goods inventory index fell slightly. So far most of the regional Fed surveys have been solid in April, although Richmond showed some slowing. The Census Bureau released the Residential Vacancies and Homeownership report for Q1 2018. The Red dots are the decennial Census homeownership rates for April 1st 1990, 2000 and 2010. The HVS homeownership rate was unchanged at 64.2% in Q1, from 64.2% in Q4. I'd put more weight on the decennial Census numbers - and given changing demographics, the homeownership rate has probably bottomed. The HVS homeowner vacancy decreased to 1.5% in Q1. Overall this suggests that vacancies have declined significantly, and my guess is the homeownership rate has bottomed - and that the rental vacancy rate has bottomed for this cycle. In the week ending April 21, the advance figure for seasonally adjusted initial claims was 209,000, a decrease of 24,000 from the previous week's revised level. This is the lowest level for initial claims since December 6, 1969 when it was 202,000. The previous week's level was revised up by 1,000 from 232,000 to 233,000. The 4-week moving average was 229,250, a decrease of 2,250 from the previous week's revised average. The previous week's average was revised up by 250 from 231,250 to 231,500. The dashed line on the graph is the current 4-week average. The four-week average of weekly unemployment claims decreased to 229,250. • At 8:30 AM ET, The initial weekly unemployment claims report will be released. The consensus is for 230 thousand initial claims, down from 232 thousand the previous week. • Also at 8:30 AM, Durable Goods Orders for March from the Census Bureau. The consensus is for a 1.7% increase in durable goods orders. • At 10:00 AM, the Q1 2018 Housing Vacancies and Homeownership from the Census Bureau. This graph shows the month-to-month change in the NSA Case-Shiller National index since 1987 (through February 2018). The seasonal pattern was smaller back in the '90s and early '00s, and increased once the bubble burst. The Federal Reserve Bank of Philadelphia has released the coincident indexes for the 50 states for March 2018. Over the past three months, the indexes increased in 49 states and decreased in one, for a three-month diffusion index of 96. In the past month, the indexes increased in 47 states, decreased in one, and remained stable in two, for a one-month diffusion index of 92. Once again, the map is mostly green on a three month basis. In March, 48 states had increasing activity (including minor increases). The Chemical Activity Barometer (CAB), a leading economic indicator created by the American Chemistry Council (ACC), slipped 0.1 percent in April to 121.6 percent on a three-month moving average (3MMA) basis. This follows six consecutive monthly gains and a dip from the barometer’s highest point since modeling began. The barometer remains up 3.8 percent on a 3MMA compared to a year earlier. Mortgage applications decreased 0.2 percent from one week earlier, according to data from the Mortgage Bankers Association’s (MBA) Weekly Mortgage Applications Survey for the week ending April 20, 2018. The average contract interest rate for 30-year fixed-rate mortgages with conforming loan balances ($453,100 or less) increased to its highest level since September 2013, 4.73 percent, from 4.66 percent, with points increasing to 0.49 from 0.46 (including the origination fee) for 80 percent loan-to-value ratio (LTV) loans. According to the MBA, purchase activity is up 11% year-over-year. "Mortgage Rates Push Farther Into 4-Year Highs"
IMPORTANT NOTE: The data below is based on the Census 2017 estimates. Housing economist Tom Lawler has pointed out some questions about the Census estimates, see: Lawler: "New Long-Term Population Projections Show Slower Growth than Previous Projections but Are Still Too High"
Four years ago, I wrote: Census Bureau: Largest 5-year Population Cohort is now the "20 to 24" Age Group. In 2016, I followed up with Largest 5-year Population Cohorts are now "20 to 24" and "25 to 29" and U.S. Demographics: Ten most common ages in 2010, 2015, 2020, and 2030. Last week the Census Bureau released the population estimates for 2017, and I've updated the table from the previous post (replacing 2015 with 2017 data). The table below shows the top 11 cohorts by size for 2010, 2017 (released this month), and Census Bureau projections for 2020 and 2030. This is positive for housing and the economy. This graph, based on the 2017 population estimate, shows the U.S. population by age in July 2017 according to the Census Bureau. And below is a table showing the ten most common ages in 2010, 2017, 2020, and 2030 (projections are from the Census Bureau). Note the younger baby boom generation dominated in 2010. By 2017 the millennials have taken over. And by 2020, the boomers are off the list. It has been eleven years since the bubble peak. In the Case-Shiller release this morning, the seasonally adjusted National Index (SA), was reported as being 8.2% above the previous bubble peak. However, in real terms, the National index (SA) is still about 10.8% below the bubble peak (and historically there has been an upward slope to real house prices). The year-over-year increase in prices is mostly moving sideways now around 6%. In February, the index was up 6.3% YoY. Usually people graph nominal house prices, but it is also important to look at prices in real terms (inflation adjusted). Case-Shiller and others report nominal house prices. As an example, if a house price was $200,000 in January 2000, the price would be close to $284,000 today adjusted for inflation (42%). That is why the second graph below is important - this shows "real" prices (adjusted for inflation). The first graph shows the monthly Case-Shiller National Index SA, and the monthly Case-Shiller Composite 20 SA (through February) in nominal terms as reported. In real terms, the National index is back to November 2004 levels, and the Composite 20 index is back to May 2004. New home sales for March were reported at 694,000 on a seasonally adjusted annual rate basis (SAAR). This was well above the consensus forecast, and the three previous months were revised up, combined. Earlier: New Home Sales increase to 694,000 Annual Rate in March. Sales are up 10.3% through March compared to the same period in 2017. Solid growth, and the next five months will be an easy comparison to 2017. The "distressing gap" graph shows existing home sales (left axis) and new home sales (right axis) through March 2018. This graph starts in 1994, but the relationship had been fairly steady back to the '60s. The Census Bureau reports New Home Sales in March were at a seasonally adjusted annual rate (SAAR) of 694 thousand. The previous three months were revised up, combined. "Sales of new single-family houses in March 2018 were at a seasonally adjusted annual rate of 694,000, according to estimates released jointly today by the U.S. Census Bureau and the Department of Housing and Urban Development. This is 4.0 percent above the revised February rate of 667,000 and is 8.8 percent above the March 2017 estimate of 638,000." The months of supply decreased in March to 5.2 months from 5.4 months in February. "The seasonally-adjusted estimate of new houses for sale at the end of March was 301,000. This represents a supply of 5.2 months at the current sales rate." In March 2018 (red column), 68 thousand new homes were sold (NSA). Last year, 61 thousand homes were sold in March. This was well above expectations of 630,000 sales SAAR, and the previous months were revised up, combined. I'll have more later today. 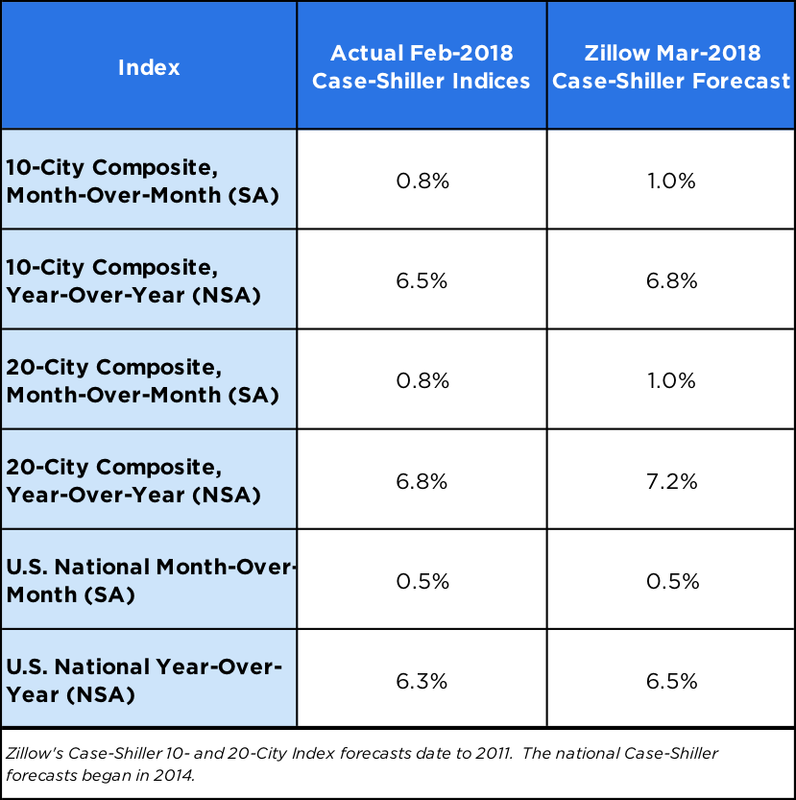 The S&P CoreLogic Case-Shiller U.S. National Home Price NSA Index, covering all nine U.S. census divisions, reported a 6.3% annual gain in February, up from 6.1% in the previous month. The 10-City Composite annual increase came in at 6.5%, up from 6.0% in the previous month. The 20-City Composite posted a 6.8% year-over-year gain, up from 6.4% in the previous month. Seattle, Las Vegas, and San Francisco continue to report the highest year-over-year gains among the 20 cities. In February, Seattle led the way with a 12.7% year-over-year price increase, followed by Las Vegas with an 11.6% increase and San Francisco with a 10.1% increase. Thirteen of the 20 cities reported greater price increases in the year ending February 2018 versus the year ending January 2018. Before seasonal adjustment, the National Index posted a month-over-month gain of 0.4% in February. The 10-City and 20-City Composites both reported increases of 0.7%. After seasonal adjustment, the National Index recorded a 0.5% month-over-month increase in February. The 10-City and 20-City Composites both posted 0.8% month-over-month increases. All 20 cities reported increases in February before and after seasonal adjustment. “Home prices continue to rise across the country,” says David M. Blitzer, Managing Director and Chairman of the Index Committee at S&P Dow Jones Indices. 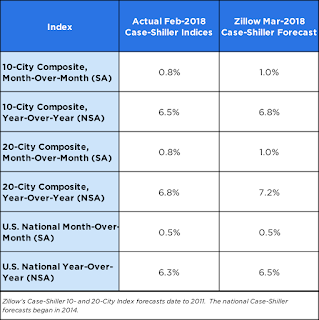 “The S&P CoreLogic Case-Shiller National Index is up 6.3% in the 12 months through February 2018. Year-over-year prices measured by the National index have increased continuously for the past 70 months, since May 2012. Over that time, the price increases averaged 6% per year. This run, which is still ongoing, compares to the previous long run from January 1992 to February 2007, 182 months, when prices averaged 6.1% annually. With expectations for continued economic growth and further employment gains, the current run of rising prices is likely to continue. The Composite 10 index is off 1.6% from the peak, and up 0.7% in February (SA). The Composite 20 index is 1.3% above the bubble peak, and up 0.8% (SA) in February. The National index is 8.2% above the bubble peak (SA), and up 0.5% (SA) in February. The National index is up 46.3% from the post-bubble low set in December 2011 (SA). The Composite 10 SA is up 6.5% compared to February 2017. The Composite 20 SA is up 6.8% year-over-year. Mortgage rates moved markedly higher today, officially leaving them at new 4-year highs. • At 9:00 AM ET, S&P/Case-Shiller House Price Index for February. The consensus is for a 6.2% year-over-year increase in the Comp 20 index for February. • Also at 9:00 AM, FHFA House Price Index for February 2018. This was originally a GSE only repeat sales, however there is also an expanded index. • At 10:00 AM, New Home Sales for March from the Census Bureau. The consensus is for 630 thousand SAAR, up from 618 thousand in February. • Also at 10:00 AM, Richmond Fed Survey of Manufacturing Activity for April. It appears the YoY declines are slowing, and especially in California. The graph below shows the year-over-year change for non-contingent inventory in Las Vegas, Phoenix and Sacramento (through March), and also total existing home inventory as reported by the NAR (also through March 2018). Note that inventory in Sacramento was up 19% year-over-year in March (inventory still very low), and has increased year-over-year for six consecutive months. Also note the inventory is still down sharply in Las Vegas (red), but the YoY decline has been getting smaller. 1) Overall sales in March were up 3.3% year-over-year (including homes, condos and manufactured homes). 2) Active inventory is now down 12.9% year-over-year. This is the seventeenth consecutive month with a YoY decrease in inventory. Earlier: NAR: "Existing-Home Sales Climb 1.1 Percent in March"
1) As usual, housing economist Tom Lawler's forecast was closer to the NAR report than the consensus. See: Lawler: Early Read on Existing Home Sales in March. 2) Inventory is still very low and falling year-over-year (down 7.2% year-over-year in March). More inventory would probably mean smaller price increases, and less inventory somewhat larger price increases. This was the 34th consecutive month with a year-over-year decline in inventory. Sales NSA in March (434,000, red column) were above sales in March 2017 (355,000, NSA). Sales through March are down about 2% from the same period in 2017. This is a small decline - and it is too early to tell if there is an impact from higher interest rates and / or the changes to the tax law on home sales. NAR: "Existing-Home Sales Climb 1.1 Percent in March"
Existing-home sales grew for the second consecutive month in March, but lagging inventory levels and affordability constraints kept sales activity below year ago levels, according to the National Association of Realtors®. Total existing-home sales, which are completed transactions that include single-family homes, townhomes, condominiums and co-ops, rose 1.1 percent to a seasonally adjusted annual rate of 5.60 million in March from 5.54 million in February. Despite last month's increase, sales are still 1.2 percent below a year ago. Total housing inventory at the end of March climbed 5.7 percent to 1.67 million existing homes available for sale, but is still 7.2 percent lower than a year ago (1.80 million) and has fallen year-over-year for 34 consecutive months. Unsold inventory is at a 3.6-month supply at the current sales pace (3.8 months a year ago). Sales in March (5.60 million SAAR) were 1.1% higher than last month, but were 1.2% below the March 2017 rate. According to the NAR, inventory increased to 1.67 million in March from 1.59 million in February. Headline inventory is not seasonally adjusted, and inventory usually decreases to the seasonal lows in December and January, and peaks in mid-to-late summer. Inventory decreased 7.2% year-over-year in March compared to March 2017. Months of supply was at 3.6 months in March. • At 8:30 AM ET, Chicago Fed National Activity Index for March. This is a composite index of other data. • At 10:00 AM, Existing Home Sales for March from the National Association of Realtors (NAR). The consensus is for 5.28 million SAAR, down from 5.54 million in February. Housing economist Tom Lawler estimates the NAR will reports sales of 5.51 million SAAR for March. From CNBC: Pre-Market Data and Bloomberg futures: S&P 500 are down 16, and DOW futures are down 138 (fair value). Oil prices were up over the last week with WTI futures at $68.22 per barrel and Brent at $73.91 per barrel. A year ago, WTI was at $49, and Brent was at $50 - so oil prices are up about 40% year-over-year. Here is a graph from Gasbuddy.com for nationwide gasoline prices. Nationally prices are at $2.76 per gallon. A year ago prices were at $2.42 per gallon - so gasoline prices are up 34 cents per gallon year-over-year. Goldman: "Moving Beyond Full Employment"
We now see the labor market as at or a bit beyond full employment. ... we estimate a structural unemployment rate of about 4.5%, modestly above the current 4.1% rate. While the cyclical participation gap has recovered more slowly, it too now appears closed. A further cyclical boost to participation is possible, but we expect it to be quite limited. Meanwhile, the pace of job creation shows no sign of slowing. ... We see little evidence that supply constraints will impose a forceful natural deceleration any time soon, and instead expect robust labor demand to drive the unemployment rate to 3.6% by end-2018 and 3.3% by end-2019, the lowest rate since the Korean War. Mericle argues that the US economy is at or close to "full employment", that job gains will remain healthy for some time, and that wage growth is only "moderately disappointing".